There has been some talk in the news about a potentially toxic chemical called PFOA. Should you be concerned about PFOA in your nonstick cookware? PFOA is short for perfluorooctanoic acid (also called C8), a synthetic chemical compound that is used, along with PTFE, to manufacture certain fluoropolymer- and telomer-based consumer products, including nonstick pan coatings like Teflon. The resulting products contain no or only trace amounts of PFOA, and the Environmental Protection Agency does not have enough information about the product to suggest that using the products could cause a health risk or concern. However, because this chemical is used in the manufacturing process, it has been found in low levels in the environment and even in the bloodstream of a sample of the U.S. population. It has been found to affect the development of laboratory animals, as well as other adverse effects on their health. In 2004, the EPA took administrative action against DuPont (manufacturer of Teflon), accusing the company of failing to report risk of injury to human health and to the environment due to exposure to PFOA between the period of 1981 to 2001. Consequently, in 2005 DuPont paid a $10.25 million settlement for violating federal environmental statutes. In 2006, the EPA launched a PFOA stewardship program, inviting the 8 major fluoropolymer and telomer manufacturers to participate in eliminating the use of PFOA from emissions and product content by 2015. The first goal was to reduce emissions and content of PFOA by 95 percent by 2010. Most of the companies, including DuPont and 3M, met or exceeded that goal, so the industry is well on its way to its goal of eliminating the use of PFOA completely. The EPA's efforts seem to be working: By 2007, studies showed that the concentration of PFOA in a sample of the U.S. population's bloodstream (collected in 2003-2004) was 25 percent less than that in samples collected in 1999-2000. Should You Be Concerned About Using Nonstick Cookware? The Food and Drug Administration closely monitors the cooking equipment available to the general public, and on the heels of the EPA's statements about PFOA, issued a statement reaffirming its position that products with nonstick coatings are safe for the American public to use when used as intended. Do not overheat the cookware and bakeware. 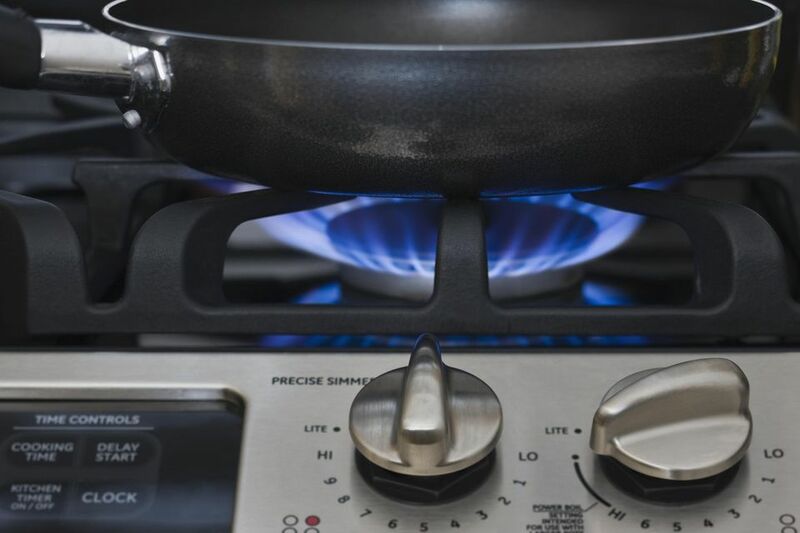 Teflon and other coatings can begin to break down when the temperature reaches 500˚F, and the Environmental Working Group has reported that potentially carcinogenic fumes are released when pans are overheated. To avoid overheating, do not preheat an empty pan, and use low or medium heat for cooking. Don't leave dry or empty cookware on a hot burner or in a hot oven. Use wooden, silicone and plastic utensils on the pan to avoid scratching or chipping the finish. Discard pans that are damaged immediately. Keep birds out of the kitchen. With their sensitive respiratory tracts, birds can become sick, or even die, from fumes created by cooking, even when nonstick cookware is not being used. Don't store nonstick cookware stacked, or if you do stack it, layer paper towels or a soft cloth between each pot or pan. Read more information from the EPA on PFOA. How Safe are Nonstick Coatings for Cooking? Nonstick Cookware Vs. Stainless Steel: Which is Better?